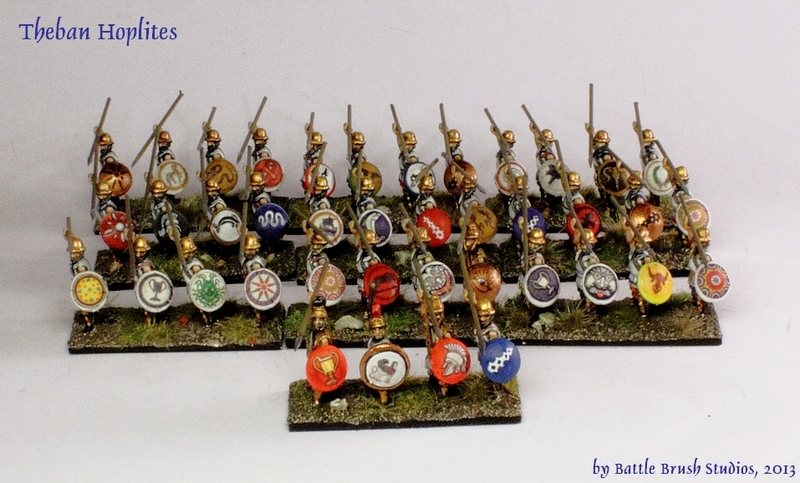 Here's my first army painted for DBA (De Bellis Antiquitatis). DBA is a game I have grown quite fond of over the past months. I only had two games so far but both were fast, enjoyable and gave historically plausible results and maneuvers. A very nice aspect about the game is that every army is limited to twelve units or bases so the lot you see in the first picture is a whole army. The miniatures are 15mm scale by Essex Miniatures. The quality of the sculpts as well as casting are alright, the metal used is rather soft and not brittle at all. 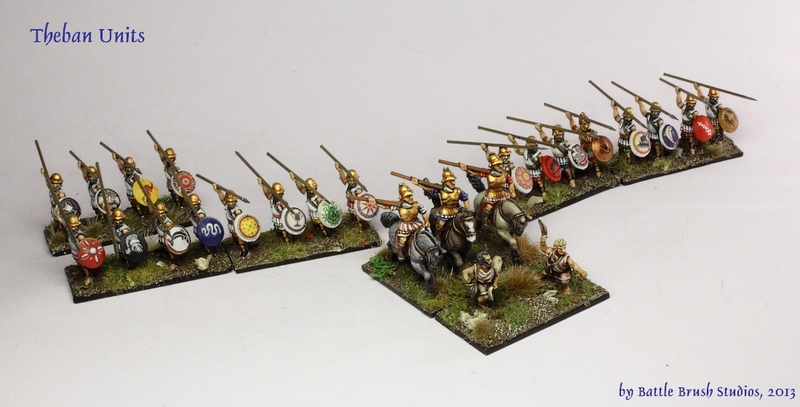 Those figures are pretty good overall but not quite up to par with the premium quality Ancients miniatures by Xyston. The biggest downside to those miniatures is that all of them, apart from the Psiloi with the slings, are monoposed. 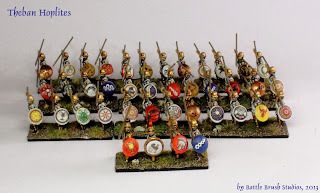 That is less of a problem with the Hoplites on which I used different colour patterns on each individual man's armour, different colours and patterns on each shield and different angles of spears to make up for that. The cavalry however suffer a bit from the mono-pose. Despite all of this, I think that the army came out very well. It's rather cheerful and bright force and I read much about Theban Greek history before getting to paint. Especially with historicals, I take research very seriously. Not only you get to learn something new and exciting every time, it's also important to know how these soldiers fought, who they were, what they looked like and so on. I hope that you like this little army. if you're interested in getting into DBA or Ancients wargaming yourself there are various resources on the topic to be found online and of course if you're interested in a Battle Brush Studios paint-/modelling-/conversionjob on your models, feel free to contact me via the comments section, Facebook of by e-mail!